Snack | All the food that's fit to eat. All the food that's fit to eat. I attribute this dip to my mother-in-law Linda, but I’ve found it’s a pretty common recipe online as well. Tweak it as you please. Sometimes mayo freaks me out so I minimized that and maximized the spinach. 1. Thaw and drain the spinach. Usually I microwave it to speed up the process, but you could just leave it on the counter for a while. I squeeze all the water out through a strainer. 2. Chop the water chestnuts if they’re not finely diced. 3. Mix whole thing of sour cream, the mayo and the soup mix in a bowl. 4. Stir in water chestnuts and spinach. Leave to set overnight. I use reduced fat sour cream and light mayo, but you can use full fat if you want. The dip traditionally goes in a hollowed out loaf of sourdough bread (I highly recommend doing this), but is also great with crackers and vegetables. The whole thing takes probably 15 minutes to make, which is a giant win. Make this for any party or just because you feel like it and it’s freakin’ good. I haven’t posted anything in a while… I also haven’t cooked in a while. Coincidence? Not likely. In an effort to start cooking again and also make something healthier than pepperoni pizza I put together this tasty low-key casserole from mostly items I already had in the fridge. My intention was to make a bechamel sauce, but realized I didn’t have flour, the result was a bit more rustic. 1. Preheat oven to 350 degrees. Put your pasta water on to boil and pop some olive oil in a pan to heat up a little for cooking the chicken. I cooked the chicken with just salt and pep, but if you have a favorite spice, by all means go for it. I think thyme would probably have been delicious, or oregano. 2. While your water boils and your chicken cooks, chop a half of an onion and the veggies. I used bell peppers and broccoli, which we had in the fridge. Green beans, tomatoes, spinach or anything else you have in there would be just as good. In fact, if I did make bechamel sauce, I think a spinach and mushroom casserole would have been bomb. 3. Pull your cooked chicken out of the pan to sit for a minute and pop about a cup of chicken broth in the pan. Cook the onions in this broth and then when those are soft, pop in your veggies to cook just a little before they go into the casserole. I prefer well cooked veggies, but if you like yours crunchy, that works too. 4. By now your water is DEFINITELY boiling so put the pasta in and cook to al dente so it’ll absorb some of the moisture from the veggies etc. at a later time. Shred the cooked chicken. 5. Dump cooked pasta, then veggies, then chicken, then ricotta in a pyrex and mix well. Pour a little half and half over the thing so it can get more saucy when it bakes. Sprinkle any kind of shredded cheese (I used mozz because we had it) over the casserole then sprinkle breadcrumbs over that. 6. Bake for an additional 30 minutes or as long as you can wait before eating it. Everything is cooked so it’s immediately fair game. I gave it 7 minutes before my resolve broke. I then put it back in 2 servings lighter and baked it for a little longer. For those of you unfamiliar with quinoa it’s pretty much like rice, but better for you. For those of you who shall remain nameless (Cathy Marzi) who don’t know how to pronounce it – it’s keen-wah. I get this wrong on the regular as well. Is Queens-accent a hereditary trait? Anyhoo – thank you to Kirsten for sharing! It’s delicious and allegedly pretty healthy. 1. Put some water and salt in a pot to boil – follow the directions on your package of quinoa to see how much water that is. Mine vastly underestimated so keep an eye on it. Wash quinoa in a strainer (I didn’t do this – K, why does this need to be done?). 2. 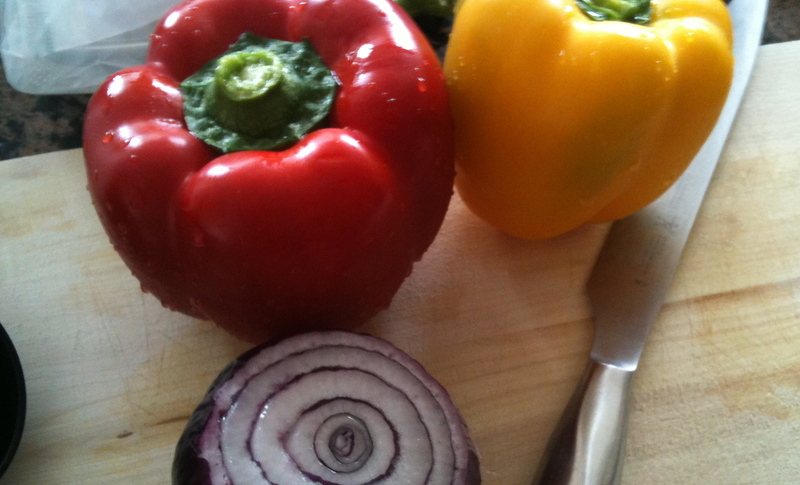 While the water boils, finely dice your onion, red pepper and yellow pepper. 3. Once the water boils, pop your Quinoa in, stirring occasionally. You may have to add more water. Just a reminder. Don’t be so literal. 4. Put another pot on with a little water in it to boi and finely chop the kale. Also finely chop the artichoke hearts. Pop the kale into your boiling water and mix the dressing in a little side bowl. 5. Drain the cooked kale and put it in a large bowl, dump the rest of your chopped stuff in the bowl and when the quinoa is fully cooked, dump that in too. You now have a giant bowl of awesome all you need to do is stir in the dressing and chill. Stir that in right away and pop in the fridge so it can all blend together. – Basil: I love basil, but forgot it when I went to the grocery store. Doesn’t hurt the recipe to leave it out. I bet it would be extra tasty with it in. – Pesto: I also love pesto, but am a snob. I make my own pesto y’all and I didn’t have time to try this. If you do try it with pesto, leave me a comment. Was it scrumptious? I need to know. Have a good snapshot of the finished product? Send it over! I forgot to take a quick picture and the salad was gobbled up too fast. This one goes out to Miss Kristen Rich who reminded me that the content in this blog is getting pretty stale. Fish tacos have to be one of the easiest things ever to cook. They require very little cooking at all, and while you can get as fancy and homemade as you want, the basics are all simple. Two filets should be one package of fish from your grocery store. I like any kind of white fish, doesn’t make too much of a difference for tacos. So long as it’s fresh, you’re golden. 1. Dump half the packet of taco seasoning in a pan that will just barely fit the two filets side by side and add about a half an inch of water, turn the heat to medium. After a minute or so pop your fish in. 2. While your fish heats up in the spices a little bit, chop the two tomatoes and chop lettuce if you’re into that. I buy the pre-chopped lettuce (read as: lazy). 3. Flip your fish. At the same time, pop some shredded cheese onto a couple of tortillas on a plate and pop it in the microwave. You could get fancy here and do it in a pan, but seriously, why. You have a microwave. Use it. 20-30 seconds should make the cheese a little melty. 4. 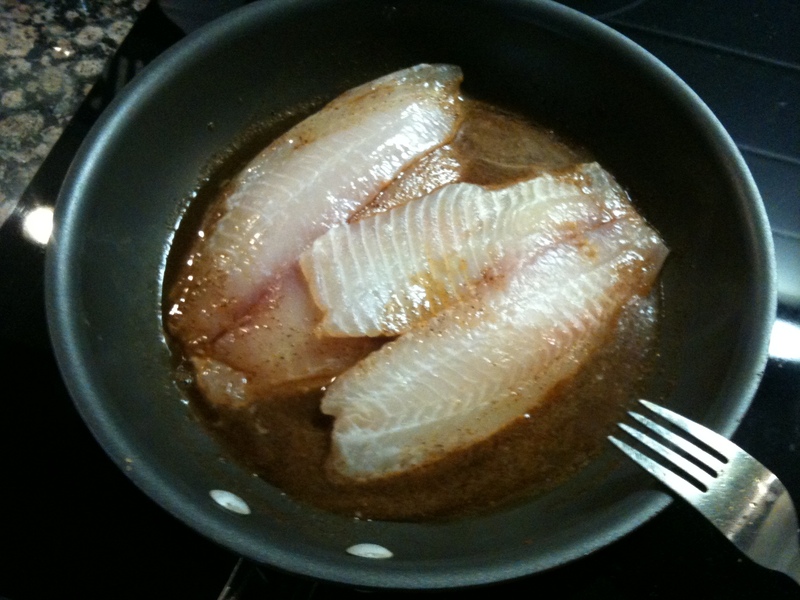 Break up the fish in the pan. If it’s fully cooked, take a bite. Need more spice? Now’s the time to add it. 5. Assemble the tacos! 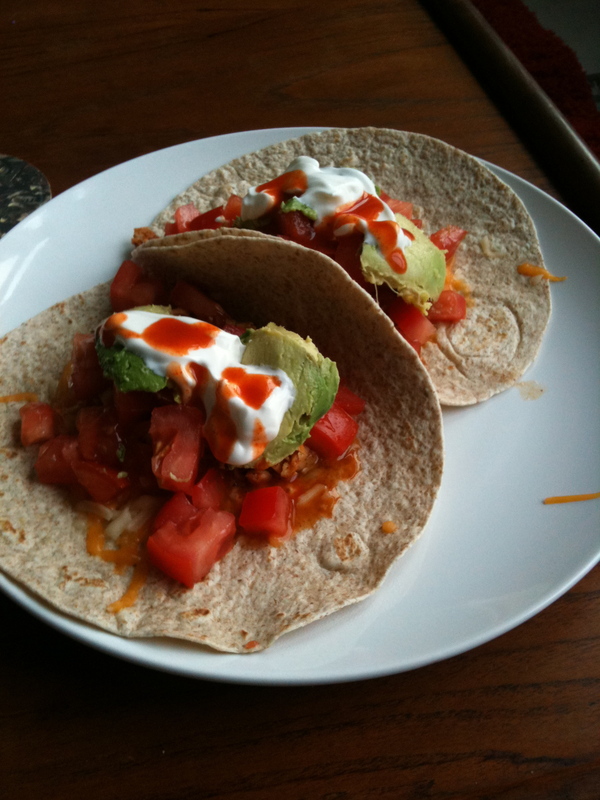 I like this order: melted cheese, fish, some scooped avocado, sour cream, chopped tomatoes, Cholula sauce and lettuce. I lied about the lettuce though; I hate lettuce. Tacos are great because all the ingredients can be used for other stuff. Leftover vegetables? Make a salad! Leftover tortillas and cheese? Make a quesadilla! The tacos should take no more than 20 minutes to put everything 100% together and make about three tacos per person if you spread the ingredients out reasonably. This is a great meal when you just want to eat something that tastes good and doesn’t take you away from the TV since the Knicks are being televised in Canada. I always have very lofty goals for dinner, but when it comes down to it, dinner happens during sporting events and I’d rather watch those. This stir fry takes under 30 minutes, if even that, and requires one pan. This means you can get back to your sporting event as soon as possible. Another idea is to put a TV in your kitchen. 1. Fill a giant pan with water, a sprinkling of salt, and set it to boil. This is out of sheer laziness, so if you want to use a pot go for it. I like to minimize how many dishes need washing. While you’re waiting for the water to boil, thinly slice your garlic and mince your ginger. It should net out to about a large tablespoon of each item, but if you love either ingredient, feel free to add more. 2. When the water starts to boil, toss in your green beans. Don’t forget to cut the ends off. When those are done (just a few minutes, spoon one out and take a bite to make sure it’s cooked, but still crisp) drain them and leave them in the sink for a minute to cool. When they’re cool, chop them into thirds. 3. Once your pan is free (post draining the green beans) pour in 3-4 tablespoons of sesame oil. The pan should be warm already so the oil will only take a minute to heat up. Then toss in your ginger and garlic. Let that cook a little. 4. Put your chicken in the pan and sprinkle the soy sauce over it. The amount of soy sauce to use is kind of subjective to how salty you like your food. Start with a little, add more as needed. Once your chicken is cooked on one side, toss it over to cook on the other and add your green beans back in. At this point you can pop your rice in the microwave. 5. Put half the bag of rice on one plate, half on the other, and split up your chicken and green beans. Sprinkle sesame seeds on top if you want to be fancy and happen to have them in the cabinet (which I did, or they wouldn’t appear in this recipe). 6. Go back to the TV with your dinner and catch the rest of the game. These are bangin’. I pulled this recipe off of Allrecipes.com and changed it just a little bit… well, I kind of don’t measure appropriately, so I can’t attest to how much I changed it. For the most part though, it’s an easy, delicious, fairly quick breakfast. 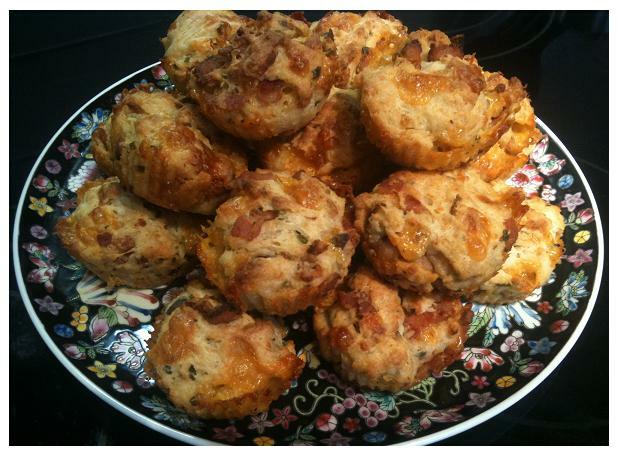 I think they’d be good as finger food for a party too since bacon is good any time of the day. 1. Preheat the oven to 400 degrees F. Put a parchment cupcake cup in each hole in your muffin tin. The parchment paper ones work the best because the muffins don’t stick to them and then you can slide them out when you’re ready to plate. 2. Cook your bacon in a large, deep skillet. It took me 3-4 rounds to get all the bacon cooked up. If you don’t know how to cook bacon, I pity you. Just pop it in a pan, flip it over after it starts shriveling up, and then take it out and put it on a plate with a few sheets of paper towels on it to soak up some of the grease. I suggest cooking the bacon to death, it makes it easier to chop up. I also went as far as to pat the bacon down after it cooled down to make it easier to chop as well. 3. In a large mixing bowl, combine flour, sugar, baking powder, salt, garlic powder, chives, parmesan cheese, cheddar cheese, egg, milk, cream of mushroom soup and vegetable oil. In that order. Dry to wet. Once your bacon is all cooked and chopped, add that too. – Since I didn’t have a cheese shredder, which the recipe calls for, I just chopped the cheddar up into tiny cubes. This worked fine. – I put in the recommended amount of garlic powder, but when I tossed all the ingredients I couldn’t smell the garlic anymore so I gave it a couple more shakes. This is totally at your discretion. Eyeballing (or nose-balling it?) worked for me. – I also gave the chives a couple extra shakes because I thought the dry mixture could use a little more coverage. 4. Spoon the batter into your muffin pan. You can put about the equivalent of 2 big tablespoons (so the cup is about half full). Bake for 25 minutes. These are so damn good, there are no words. They’re super easy to make since for the most part you’re just putting ingredients together. I can attest these muffins will ensure a GOOD morning. And they make your kitchen smell divine. Disclaimer: I also included about 2 teaspoons worth of the bacon drippings in the batter. This is the peak of unhealthiness, but makes the bacon flavor more intense. It’s optional depending on the level of artery clogging you are interested in. Sangria is one of my favorite summer drinks. It’s sweet, alcoholic, and I can claim I’m consuming fruit. Full disclosure: this recipe was stolen from my cousin Samantha who makes the best sangria in the world, but refuses to commit her recipes to paper (to spite me I believe) thus leaves out ingredients. This is what I have gathered from taste-testing and lurking her while she stirs. 1. Pour liquids into whatever receptacle you plan on using. Eyeball how much OJ to use. I like enough to make the Sangria just a little cloudy, but also enjoy taste testing to ensure accuracy. 2. Slice up your fruit. It’s for show to make you feel like you’re drinking something that has a positive benefit for your health. The recipe makes about 10 servings of Sangria… depending on how giant a glass you like to drink from. I like mine huge, so that’s what she said. Feel free to add more of something, or lose something you don’t like. I find the making of Sangria turns out better when you start out sober, so if you feel like you may need a second batch, I highly recommend making it up front. 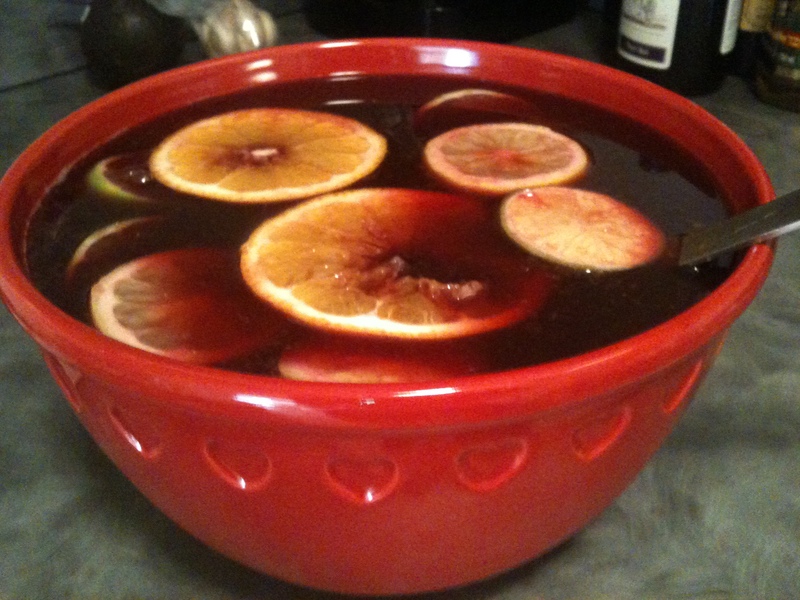 Only two more weekends left this summer – get your Sangria on! Meet the editor/contributor/food aficionado. I love food. Everyone should believe in something... I believe I'll have another drink!